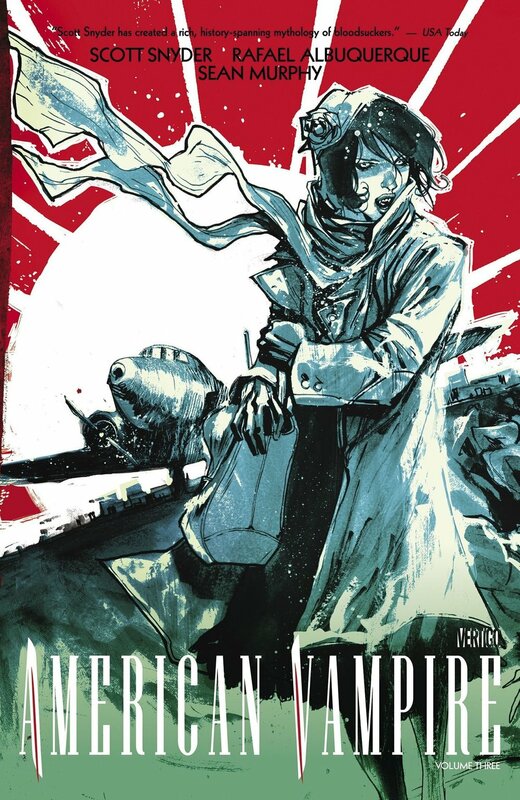 In this first American Vampire mini-series, Snyder catches us up on the exploits of characters from earlier arcs of the comic: Cash McCogan and Felicia Book. The pair teams up for the Vassals to investigate a scientist in Romania who claims to have found a cure for vampirism. That’s not all he’s found: he has also been overrun by Nazis and vampires, who hold many of the same values. I’m not always a fan of side stories and spin-offs, but Survival of the Fittest feels necessary—Snyder uses it to build out the world’s mythology naturally, without hanging it on Pearl and Skinner’s story. Sean Murphy’s precise, architectural lines create a different sense of dread in Survival of the Fittest than the main series’ looser style; environments are precise, engineered, and looming—the sense of scale dwarfs Cash and Felicia to the point of insignificance. Dave Stewart’s colors, however, keep the book’s look consistent with previous arcs. Survival of the Fittest feels just like another arc of American Vampire in many respects. The change in art style and addition of mythological, world-building elements, however, give it a distinct tone and reason for existing alongside the main series.